Announcement Handmade jewelry with a Native American flair. I love designing and making jewelry. I am Navajo from Northern Arizona. I use genuine turquoise, top-quality beads and sterling or fine silver. Thank-you for looking and visiting my shop. Please feel free to comment or contact me if you have any questions. Handmade jewelry with a Native American flair. I love designing and making jewelry. I am Navajo from Northern Arizona. I use genuine turquoise, top-quality beads and sterling or fine silver. Thank-you for looking and visiting my shop. Please feel free to comment or contact me if you have any questions. Love these earrings! Fast shipping and a great seller to purchase from! Thank you!!! Thank you, Norria! The bracelet is beautiful and looks fantastic with a wrap bracelet I purchased from you, which I wear all the time. Love the quality of your work. Quick delivery. I wish I could leave more than five stars. This is beautiful! I feel empowered wearing it. Great communication with the vendor and it shipped quickly. Highly recommend. Working on making earrings with purple seed beads. I'm using the left over black leather cord from the wraparound bracelet that is tagged in this photo. My first time working with elk ivory. I'm happy with the finished look! Almost done! 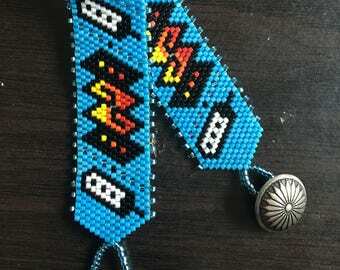 Kingman turquoise, 5 mm rounds with black seed beads. Hello, my name is Norria and I am Navajo from New Mexico. About a year ago, I started making my own jewelry. I wanted to wear pieces that were unique so I started making necklaces and earrings. I got so many nice compliments on my pieces, so i decided to show and sell some of my creations. I put my heart and soul in every one of my pieces and I hope you enjoy them as much as I do. All purchases are returnable in original condition and packaging within 10 days of arrival, with the exception of custom made orders which are neither returnable, refundable, or exchangeable, unless there is a defect or error with the item. If you need to return or exchange an item, please contact me within 5 days of receiving your item. Shipping costs are not refundable, and return shipping is the responsibility of the buyer, unless there is a defect or error with the item, in which case I will send you a pre-paid shipping label. All items are shipped out between 3-5 business days (excluding day of purchase), sometimes even sooner. If you need your item as soon as possible, please let me know and I will try to accommodate your request. All items are shipped from Flagstaff, AZ. If you live locally and would like to arrange for pick up, please contact me prior to placing your order. All domestic items are shipped via USPS mail and include a tracking number and insurance. Expedited shipping is available upon request. All international items are shipped via USPS international first class service and include a tracking number and insurance. International arrivals can take anywhere from approximately 7-21 days, depending upon where the item is being sent. International buyers may be charged a customs fee, duty-tax fee, VAT fee, and/or postal handling fee for items arriving outside of their country. The buyer is responsible for these fees, as my shipping costs include only the cost of shipping from the U.S. Before purchasing, please check current fees with your government's customs regulations and mail courier. I am also open to trading with other Etsy sellers.